Mechatronic (mechatronic = mechanic + electronic) equipment is products which are integrated by the mechanism system, software, and the electric circuit. Since the function of mechatronic products is becoming more complex and highly functionalized, designing the system of various fields is becoming important. On the other hand, the innovation of design process by optimizing the suitable design of mechatronic products is needed, because the demand for the reduction of development process, the improvement of quality, and the cost-reduction is stronger. RecurDyn provides the various tools such as RecurDyn/CoLink, RecurDyn/Control, RecurDyn/Hydraulic, and RecurDyn/Linear to help design innovation in the mechatronics field. So, the user can perform the work conveniently and efficiently, from the design of individual mechanism system or control system to the design and test optimization to the integrated system by these tools. RecurDyn/Control and RecurDyn/Hydraulic are interface tools which are available to the multi-domain analysis through co-simulation with the famous softwares in the each filed such as Matlab/simulink, simplorer, AMEsim. RecurDyn/CoLink is the world's first software that CAE and the control algorithm are solved by an integrated solver and it provides easy-to-use user interface which is familiar with CAE. RecurDyn/CoLink also provides up to 100 times faster solver and the more accurate result than the co- simulation method because of performing the analysis by integrating the solver with the RecurDyn solver. Most of multi body dynamics models created by RecurDyn are of non-linear system. But the simplified linear model is useful in the initial step of control algorithm development by the software such as CoLink, Matlab, etc. RecurDyn/Linear provides the function which performs the linear approximation of the RecurDyn model. 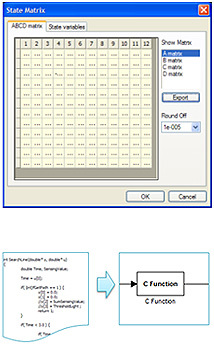 By performing the linear approximation, the user can get the ABCD matrix which can be used in CoLink, Matlab, etc. Usually the user creates the dll file by separate compiler to use the written C code. But Ch-engine embedded in RecurDyn/Colink enables the user to use the C code directly in RecurDyn/CoLink without using separate compile process. The Ch engine also supports various libraries for 2D and 3D plotting, filtering, and mathematical operations for engineering. Therefore, the user can extend the range of use range with various methods through the extended Ch libraries.